Nuclear energy can be safe, if all operational regulations are strictly observed, President Dmitry Medvedev said following talks with Turkish Prime Minister Recep Tayyir Erdogan, where nuclear co-operation topped the agenda. Among other issues, they discussed were the joint construction of a nuclear power station in Turkey. “Much attention is now given to building new nuclear power plants… Everyone is anxious about whether atomic energy can be safe,” Medvedev said pointing to the situation surrounding Japan’s Fukushima power plant. “It can be and in fact is safe, given the right location, design and operator,” he added. And all these conditions will be observed during the construction of the Turkish plant. When one of Turkish journalists asked Dmitry Medvedev if there were plans to improve the safety in the nuclear power plant that Russia was building, the Russian President answered that the project is now in such a state that such revision is not possible, but said that there was no need for such a move as the Russian project is radically different from the one used at the Fukushima station both by general design and by the protection level. At the same time, the Russian leader assured the press that the two sides would continue to optimize the work on the Turkish nuclear project. ­Regional and global security issues were also discussed during the talks. The Russian president said that both Ankara and Moscow are willing to put in their contribution to regional and global security on a bilateral level and through international organizations. ­When reporters touched upon the current situation in Libya, the Russian President said that the problems in this country had appeared a long time ago and have been accumulating since as the current regime preferred to suppress any type of dissent instead of reacting to challenges. Dmitry Medvedev noted that the UN Security Council had approved a special resolution on the situation in Libya, but Libyan authorities refuse to comply with it. The main objective in this crisis as Russia sees it is to prevent the sufferings of the civilian population, Dmitry Medvedev said. The Russian leader also said that he hoped that the Libyan authorities would follow the recommendations of the United Nations and the Arab League. At the same time, even if the UN Security Council passes a decision of announcing Libya a no flight zone the question will remain who would enforce such decision, Medvedev said. He noted that such decision must be approved by all neighboring countries and also said that land operation in Libya would mean a full scale war with foreign forces’ participation and those making decisions must understand the consequences of such scenario. ­Answering the question about energy trade between Russia and Turkey, the Russian President said that the prices in market economies are formed by supply and demand and Russia and Turkey follow the same principle in their relations. However, the Russian leader added that his country was always open to suggestions from friends and thus expected that Turkish side could propose new forms of cooperation. Following talks Russia and Turkey exchanged documents implementing a visa-free regime between the countries. 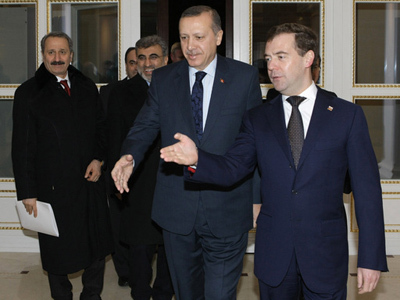 A corresponding agreement was signed in Moscow on 12 May 2010 during Medvedev’s official visit to Ankara. Under the document, Russian tourists coming to Turkey for 30 days will not require a visa. Currently, they get a tourist visa for 60 days when they cross the border. The agreement will come into force as soon as it is ratified by the parliaments of both countries. ­Last year, Russia was Turkey's second largest foreign trade partner, with turnover amounting to 25 billion dollars, which is a 29 per cent rise compared to 2009. Bilateral cooperation is particularly active in the energy sector. The Blue Stream project has been operating successfully. In addition, a number of new projects designed to strengthen regional energy security are on the agenda. They include the South Stream project, the Samsun-Ceyhan oil pipeline and the construction of Turkey’s first nuclear power station. Partnering up in such fields as ferrous metallurgy, telecommunications, the production of building materials and household electronics is also gaining momentum. Also, Turkey continues to be one of the most popular tourist destinations for Russians, with more than 3 million having visited Turkish sea resorts in 2010.